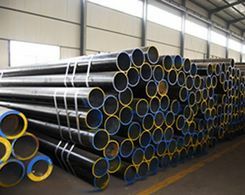 The major making techniques of seamless steel pipes are as follows. Production equipments consist of punching machine, automatic pipe rolling mill, reeling mill, sizing mill and the reducing mill. Pierce the round tube into the hollow of thick walled tube, and the axis of two rollers and rolling lines form a slant angle. in recent years the slant angle has increased from 6 ° ~ 12 ° to 13 ° ~ 17 °, promoting the punch speed. Use secondary perforation to reduce the thickness of the hollow billet walls when produce steel tubes of more than 250mm diameters. The development of new technology also has been made, which strengthened the perforation process and improve the quality of the capillary. Production equipments consist of punching machine, continuous rolling mills, and tension reduction mills. Pierce round base into hollow billet and then insert the mandrel, through continuous rolling of 7 ~ 9 two-high rolling mills. Take out the mandrel after rolling, and then reheat, proceeding with the tension reducing.14the annual output of 140 mm continuous rolling pipe units is 0.4~0.6 million tons, 2 ~ 4 times of plug rolling units. The characteristics of this kind of unit are suitable for producing steel pipes below 168mm diameter. But it has large equipment investment, large installed capacity and complex processing and manufacturing. Three-roller rolling production is mainly used for production of thick walled seamless steel pipes with high dimensional precision. Thickness accuracy seamless steel pipes produced by this kind of making technology can reach plus or minus 5%, twice as those which are produced by other ways in pipe precision. With the invention of the new type three-roller skew rolling mill in the '60 s, rapid developed this kind of making technique. New mill is characterized by rotating rapidly entry rotary rack to change expansion angle when rolling to tail, so as it can prevent triangle in the part of tail, making the ratio of outer diameter of the production varieties and wall thickness expand from 12 to 35, which not only can produce thin walled seamless welded steel pipe, but also increase the production capacity. First, pierce or expand the peeled round base, then pass through induction heating or salt bath heating, and coat surface with lubricant, loading into the extrusion machine. And metal is squeezed into a pipe through the circular gap between the mandrel and the nib. This kind of making technique mainly is used for the production of high-temperature alloy pipes, special pipes, multi-unit pipes and non-ferrous metal pipes. It is wide in production range, but the yield is low. In recent years, because of the improvements of die materials, lubricants and extrusion speed, the production of extruded tubes also has been developed. This kind of making technique is used for the production of precise and special-shaped thin walled pipes with small diameter. It is characterized by multistep circulation making technique. In the 60s it began to develop towards high speed, multi-line, long stroke, long tube blank. In addition, small roller mill also got development, which is mainly used for the production of precision tube whose thickness less than 1mm. and the cold rolling equipments are complex, hard to process with tools, not flexible in specification transformation. And it usually adopts joint process of cold rolled and cold drawn, namely to reduce the thickness of the wall with cold rolling to gain large deformation, and obtain a variety of specifications with cold drawn technique.